Inspired simply by an old map of Kowloon Walled City and her experience staying in Chungking Mansions many years ago, Betsey Biggs feeds her curiosity for the city of Hong Kong through a collaborative project with local artist Samson Young. 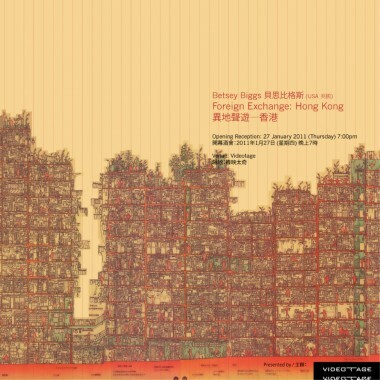 The exhibition “Foreign Exchange: Hong Kong” will be held at Videotage from January 28 to February 16. Both artists will spend one week in each other’s respective city. Based on their experiences abroad in an unfamiliar and foreign space, they will create an audio-visual installation by using the detritus collected in each other’s city. To display her interpretation of Hong Kong, Biggs will use objects, images, soundscape, as well as other inexpensive materials found in the city. Through the collection, she will construct her own version of Hong Kong city. Another part of the project “Foreign Exchange: Providence” by Samson Young will be carried out at Brown University, Providence in late April 2011.